"Lee Patterson opened the night with a live rendition of his half of the 'HEATWORKS' c.d. Mini G-clamps, crocodile clips and contact microphones was the apparatus which he used to bring the sound of burning sparklers. The room was deadly silent whilst it was happening and Lee just kept on burning those sparklers. It was a kind of 'whooshing' sound that it made. As the last sparkler was fizzling out people were ready to applaud but Patterson gestured everybody to carry on listening. What followed was the sound of the metal sparkler rods cooling down thru' the contact mics. Cranking, clicking, popping and creaking. Superb!! Opaque stepped up after Lee and gave it hell. Swopping instruments and thrashing guitars like it ain't no thing. Although, a melodious side to the group can be heard at times it was a great set and are definatley a band to look out for. Floach was next up doing his mix of jazz, techno and modified tuntable guitar (dubbed the 'plattar') bashing anarchy. Finally Villa 21 Experience arrived. An unsubtle blend of ambience, broken mixers thru' broken FX peddles and mini disc dribble which culminates into the most awesome noise experience. Gradually inviting members of the other bands to join in the noise fest, a near hour of the most disgusting din you could ever imagine." 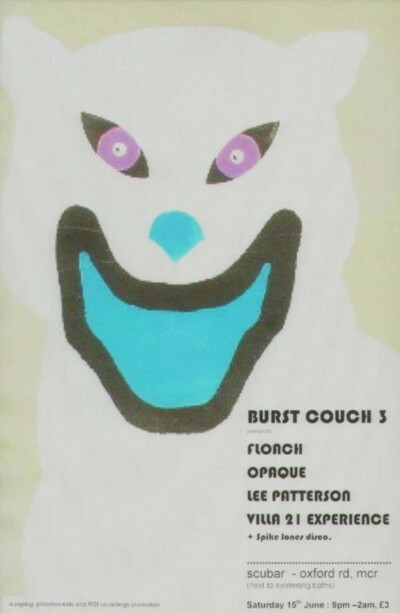 "Diving into the cellar of Scubar, the monthly Burst Couch was found to be quite literally igniting. A hush descended and all eyes and ears were trained on flickering flash and haunting hiss. Lee Patterson had close-miked some sparklers and the sound they made as they burnt was an eerie one indeed. When would the last jolt judder? Cartoon black and white 1920s movie intermissions and recorded howls of canned laughter bridged a gap with the Opaque trio at the other end. They'd travelled down from Glasgow to kick up an exuberant free rock racket. Swapping guitar, bass and drums between bursts of killer riff splatter, they made quite an impression (and not just that ol' Sonic Youth comparison). Their 'Go Now New' 7" single, split with the overdoom metal of Wuzor, formed a short reflection of their performance which petered down to a solo bass noiseblast after the drums had been more or less trashed and used as oversized guitar plectrums. The Villa 21 Experience was a big noise jammer to see the party off with a bang. Spinning around the stroppy no-input mixer feedback of Villa 21 were his guests Lord Pendro on bass and Disco Operating System on guitar (retiring early). Floach and Bess Keloid shouted irreverent obscenities into the mikes and various drunken audients picked up stray discarded instruments to have a bash. A chaotic onslaught ensued, ending with Keloid at the Opaque drum kit and Pendro's bass burping as Villa 21 jumped on the table to trash his effects pedals with a mad glint in his eye." It was one to remember for the way it went from 'real' ambience to utter abject noise....the latter was a bit over the top in retrospect and not standard fair of a BC night! Lee's live (and recorded) work is thoroughly recommended. eh? hasn't the poster changed colour? Dug out this other one and thought it was 'more friendly'!